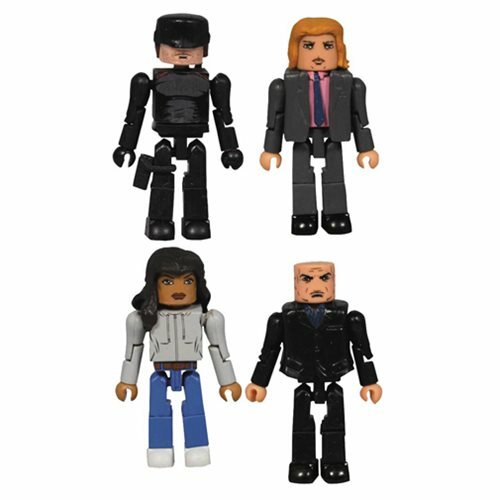 Based on the popular online Netflix series Daredevil, this box set of 4 different Minimates mini-figures features plenty of accessories and interchangeable parts! Daredevil, in his black costume, includes alternate parts to transform into blind lawyer Matt Murdock, while nurse Claire Temple includes an alternate masked head, hood, and gloved hands. Rounding out the set are Matt's partner Foggy Nelson and Hell's Kitchen crime lord Wilson Fisk, aka the Kingpin! Each 2-inch Minimates mini-figure measures 2-inches tall and features 14 points of articulation. Packaged in a full-color window box! Ages 8 and up.